Not the greatest photo from a technical standpoint, but definitely one of the cutest! . This chick loves attention! . The frizzle chicks had their first day outside in the sun today. Vitamin D is so important for chicks, and when they're babies and in a brooder, it can be easy to forget they need sun! . They had a ball playing in the dirt, meeting my other chicks (5 week olds who live in a separate brooder) and sneaking nibbles at herbs! . They also had a communal lunch of chick starter, and everyone got along great. . They probably won't get to go outside tomorrow – it's raining, and I don't want them to get wet! I thought it would be fun to share photos of my Polish hen, Harley, when she was a chick and what she looks like today. . There's quite a difference! She was very talkative as a chick, but now she's quiet and likes being held! . As a chick, I fed her my chick starter blend and Fluffiest Feathers Ever!. . Now, I still keep her on Fluffiest Feathers Ever! to keep her "pom pom" in top shape. . I can't wait for her to start laying eggs! Harley does love the swing! It was super easy to build – I just tied ribbon around a stick. . If you make one yourself, use a piece of wood that's wide. Chickens don't perch like wild birds. So, a wider swing is more comfortable. . I didn't do anything to train my hens to use the swing. They just figured it out! My Easter Egger roo challenges you to a staring contest. Which is a dangerous game with a rooster! . Know the way to his heart? Bee A Happy Hen chicken treats. He loves it. Especially the dried mealworms and bee 🐝 pollen. . It's pretty hard for most of my chickens to resist! . (click on the photo to see what I'm talking about.) . This rooster is actually much nicer than he seems in this photo. He's not the cuddly sort, but doesn't mind some attention now and then. . Do you have a cuddly rooster? Celebrating this girl today! She started laying eggs! . I think she took one sniff of Best Eggs Ever! and decided the nesting box was the place to be. . In this photo, she saw the bag, and started craning her neck (she was hiding from the boys). . She laid a smallish brown egg. 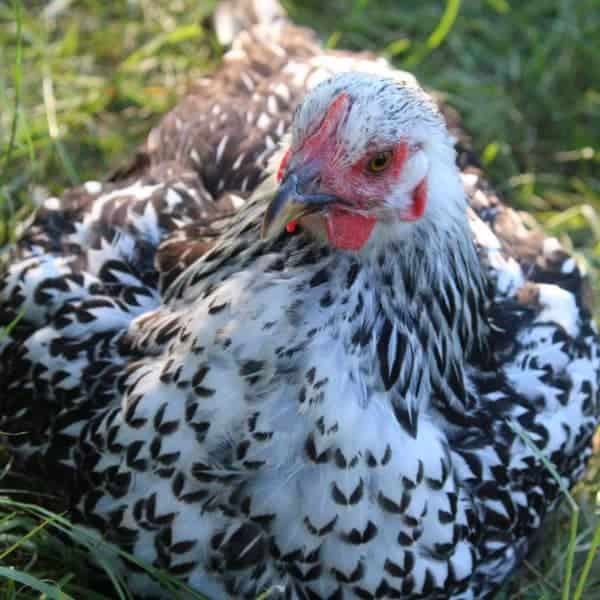 Don't ask me her breed – she's a mix i hatched in my @brinseaproductsltd incubator. . Love her!